Nearly 600 participants, 10 thematic panels, workshops and meetings, and 3 special speeches. That’s how the figures looked like for the second edition of the European Congress of Quality, which took place on March 17, 2016 in Warsaw. The only event of this type in Poland gathered representatives of the world of business, science and local governments, who throughout the day discussed topics dedicated entirely to issues related to quality. This year’s edition was held under the slogan: QUALITY. Just. The event, which was a platform for the exchange of knowledge, views and experiences, was opened by Krzysztof Stadler, president of the board of the Qualitas Foundation, who organized the whole undertaking. President Stadler reminded the guests of 10-year history of the QUALITY OF THE YEAR certificate. – It all started in 2006 when Marcin Kałużny, the current chairman of the Chapter of the Certificate, established the QUALITY OF THE YEAR initiative. He led us all the way to the Second European Congress of Quality – he said. The inauguration was also marked by the reading of a letter from the President of the Republic of Poland Andrzej Duda to the participants of the Congress. – I pay tribute to everyone participating in the discussion panels and all participants of the Congress for the inspiration of your diagnoses, achievements and ideas – wrote the President of the Republic of Poland Andrzej Duda in his letter. In an atmosphere conducive to the integration of pro-quality environments from Poland and abroad, special guests have appeared: Andrzej Blikle, author of the book “Doktryna jakości”, which touched on the subject of the leader’s dilemma; Dr. Eric Janssens, Director General of the European Organization for Quality, based in Brussels and Dr. Mag. Anni Koubek, vice president of innovation at Quality Austria, whose animated presentation about ISO 9001 standards was one of the most interesting moments of the event. – The European Congress of Quality is the only event of this type in our country that promotes quality. The Qualitas Foundation is the only organization in Poland associated with the European Organization for Quality, based in Brussels. As organizers, we are proud that thanks to our initiative we reach an increasing number of entrepreneurs and others who, like us, want to meet the highest quality standards in their operations – said Marcin Kałużny, the president of the QUALITY OF THE YEAR Certification Committee, the originator of the Congress. – Quality is a very important feature of the company. Achieving high quality TQM methods, which were discussed during the Congress, is a big chance, because it can raise the competitiveness of the company without any particular financial outlays – emphasized professor Andrzej Blikle. The main part of the 2nd ECQ was thematic discussion panels, debates and workshops on practical and theoretical aspects of quality. During the meetings, the following topics were discussed: change management, promotion and pro-quality education as well as challenges facing today’s accreditation process. There was also an industry part – during the event, dedicated sessions were held, including construction, cooperatives, agriculture and healthcare. One of the discussion topics was also the improvement of processes by eliminating waste. The invited experts discussed together which of the available tools – including Lean, Kaizen or 5S – can contribute to the improvement of the quality of services provided. 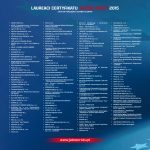 The key point of the program was the tenth awarding of QUALITY OF THE YEAR® Certificates to enterprises, organizations and science and research units, for which in 2015 high quality of products, services and innovative and ecological solutions was a priority and defined the path of development. Out of the winners, more than half received the certificate for the second or subsequent time, thus providing evidence of conscientiousness and consistency in pro-quality activities and the promotion of good business practices. Among the awarded were, among others Lotos Oil S.A., Grupa Azoty Prorem Sp. z o.o., Dan Cake Polonia Sp. z o.o., OKNOPLAST Sp. z o.o, Seifert Polska Sp. z o.o., Victoria Cymes Sp. o.o. or Roleski Sp.j. For the first time, awards were also given in the category of the Choice of Poles, which are awarded on the basis of reports on the products and services most valued by consumers. It was received, among others Przedsiębiorstwo Farmaceutyczne LEK-AM Sp. o.o. – The award received confirms what we have been striving for over the past years, i.e. to obtain high quality in the service provided to our clients. The client from our perspective is the most important aspect – emphasized Kamil Jakacki, Sales Director of Cartrack Polska Sp. z o.o., which this year for the first time received the QUALITY OF THE YEAR® Certificate in the Service category. Another novelty was the presentation of a special award from auditors of the Qualitas Foundation for the best Quality Manager of the Year 2015. The decision of the auditors represented by Katarzyna Krawiec was given a special distinction by Janusz Urbanik, President of the Board of Ventor Sp. o.o. for professionalism, CSR activities and personal involvement in the development of the company, industry and region. The title was awarded based on a number of criteria, including the level of professional ethics, relations with employees, involvement in projects improving the quality in the company and commitment to supporting the region. The 2nd European Congress of Quality was under the honorary patronage of the Marshal of the Masovian Voivodeship, the President of the City of Warsaw, the Polish Committee for Standardization, the Polish Center for Accreditation, the Polish Agency for Enterprise Development and the European Organization for Quality. Photo relation is available on the website www.jakoscroku.pl.